There is an option to login, but users can continue without logging in. Only Administrators can set-up user accounts. The benefit to users logging in is that he or she can return to saved work, accumulate statistics of time spent/how many words/records/pages they have completed and see how they rank against other contributors. Users without accounts can be allocated units of transcription and submit their work. There are facilities in which a User can create an account once they have started transcribing (subject to approval by an Administrator) so no work is lost. Option also exist for users to transcribe new or check existing transcription. Depending on your system, there are also optional links to support pages: including glossaries, transcription style, general tutorial. And also, depending on your particular configuration, buttons for each document type (Admissions Register, Minutes, Diaries, and so on) with % of pages transcribed for each. Once chosen, it will allocate the User a random unit of transcription from chosen document type opening in the App’s Transcription Interface, as detailed below. The screen is an even split between the unit of transcription, and the text box in which to enter the transcription. Image and transcription box are visible at the same time (large landscape or dual monitor access windows are recommended). The text boxes for each document type have custom formatting to reflect the text structure of that type. Submit option. Submission by transcriber moves image into queue ready for checking. Work Checkers can be allocated an image to work on in the same way as transcribers. 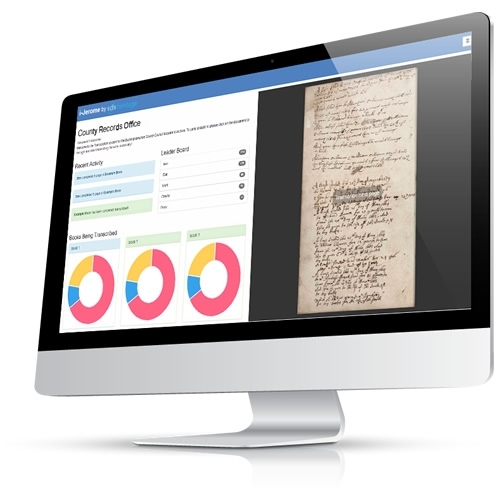 Work Checkers can have access to same digital image viewing controls as transcribers as well as transcriber’s text. Work Checkers are able to correct errors in the transcribed text. Work Checkers have the ability to mark a transcription as unfinished and return it to the queue of outstanding work, whilst retaining the text has been transcribed first time round. Once complete, checkers can submit. If no changes have been made by checker to transcription, 90% to be marked as complete, 10% to go to administrator queue for approval. If any changes have been made, transcript to go to administrator for approval. Tracking of progress made. For example: how many pages from each volume have been transcribed/checked/approved by administrators/awaiting approval; number of pages transcribed/checked by user). Reviewing of submitted transcripts, which, when selected allows the admins to see the original transcript, accept or reject any changes made at checking, edit them, and mark them up as completed, or reject them for so they are returned to the queue for re-transcription. Any words marked as illegible by transcriber are clearly flagged ready for administrator interpretation. There is the ability to accept or reject individual changes made at checking stage rather than accept/reject a whole entry at a time. Into excel, for multiple transcriptions at once. Data can be exported in CSV either a record at a time or as a whole dataset. All data fields are/can be exported as well as metadata (username of transcriber, file name of image transcribed from, reference number of original record, page number within that record, any changes made at checking/by administrator, date/time transcription completed, date/time checking completed, date/time administrator approved, user name of administrator). Function for rejected transcriptions. Also ability to force pages ‘saved’ by users back into the queue if required. Ability to upgrade a standard user’s permissions into administrator, reset user passwords, see individual user statistics.